What is a Painter's Painting ? A native of Maryland, Geraldine McKeown has been painting since childhood. She has studied with some of the most prominent artists working in watercolor today including Ed Whitney, Don Stone and Robert E. Wood. She has also studied egg tempera with Gary Akers. 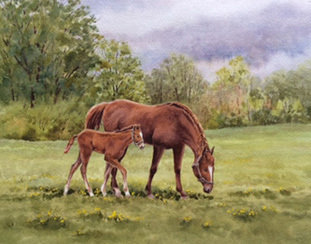 Geraldine has taught watercolor for over 20 years. The subjects Geraldine chooses to paint reflect her deep love for the Maryland countryside where she paints from a studio on a small working farm. She combines her affinity for nature with her love for flowers and collecting antiques to create landscapes and still lifes. She also enjoys trips to the rugged, pristine coast of Maine which provides a stimulating change of scenery. An accomplished watercolorist working in traditional realism, her paintings reveal her intense interest in composition and design and reflect her feeling for color and the interplay of light and shadow. She is the recipient of the BWS Silver Medal for watercolor and a number of other regional and national awards including being selected as one of the top 100 painters in the prestigious Arts for the Parks National Competition. She is an elected member of the Baltimore Watercolor Society, the Philadelphia Watercolor Club and the National Watercolor Society. 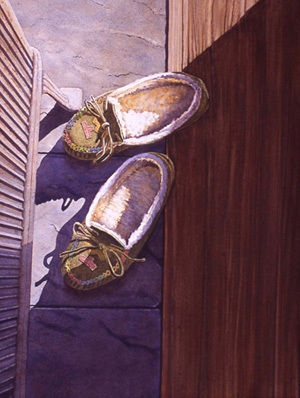 Her watercolors have been featured on the covers of "At the Head of the Bay: A Cultural and Architectural History of Cecil County, Maryland" and "Red Top Boots" by George Prettyman. Her paintings are also featured in the publications "The Best of Watercolor I & II" by Rockport Press and "Artistic Touch III" by Creative Art Press. 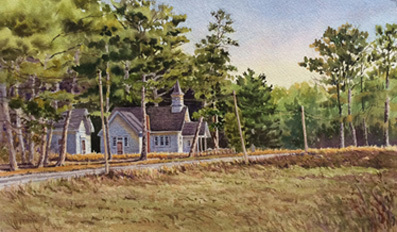 Geraldines' painting, "Warm and Toasty" was accepted into several major juried watercolor exhibitions including the Adirondack National Exhibition of American Watercolors and the Pennsylvania Watercolor Society Annual Juried Exhibition. Geraldine's paintings are included in many private and corporate collections in the United States and abroad including DuPont, AT&T, Bank of Delaware, Legg Mason, MBNA and celebrities Oprah Winfrey and Danny Glover, to name a few. McBride Gallery is pleased to represent watercolorist, Geraldine McKeown.